Higgins VITA GARDEN is made with our unique Fiber-Biotic pellets that are scientifically formulated with a multi-fiber, nutritionally balanced approach for your pet’s optimal health. Fiber-Biotic pellets blend multiple, natural fiber sources beneficial to herbivores to support overall health, digestion, and firmer stools. Higgins VITA GARDEN also contains Hemicellulose Extract, a natural soluble fiber that is also a prebiotic source to support nutrient absorption and the immune system. For added health benefits, VITA GARDEN also has protected probiotics for the most active delivery possible and DHA Omega-3 fatty acids for added immunity support. VITA GARDEN is gluten free because it does not contain wheat, which in dietary excess can lead to digestive problems. 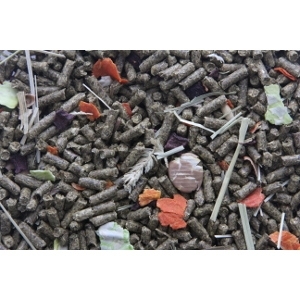 For added variety to the Fiber-Biotic pellets, VITA GARDEN contains loose, sun-cured timothy hay and flaked vegetables for natural nutrition.